Customer lifetime value (LTV) is a critical performance metric that can give you valuable insights into the health, performance, and future success of your eCommerce business. Maximizing your customer LTV through smart digital marketing for eCommerce is one of the best ways to increase profits and the longevity of your company. Use this definitive guide to learn how to calculate your customer LTV, what to do once you have your golden number, and how to master digital marketing to score repeat buyers. Learn how to conquer this integral part of the marketing process to stay competitive as an online seller in your industry. What Is Customer LTV? How Does One Calculate This? Average order value. The amount of money a typical customer spends on one trip to your eCommerce store. Find this number by dividing your total revenue for a week or quarter by the number of orders within the same time. Purchase frequency. How often the average customer returns to your online shop to place a new order. Compute this figure by dividing the total number of orders for a quarter by the total number of customers for the same time. Lifetime of the customer. The length of time a customer will continue supporting your brand. Calculate this number using comparable averages from businesses like yours. In general, a newer company will have a lifetime length of about three years. Established companies can have greater lifespans. Multiply these three values together to come up with your average customer lifetime value. In an example from Kissmetrics, a case study using Starbucks can help you see how companies use customer LTV in the real world. The case study shows an average order value of $5.90 at a frequency of 4.2 visits per week. This averages to a customer value per week of $24.30. It then states that the average lifespan of the customer is 20 years. Multiplying $24.30 times 52 weeks in a year times 20 years in a customer’s lifespan, you get a customer lifetime value of $25,272. Why Is Customer LTV Important? Customer lifetime value can inform your entire marketing strategy. It can help you come up with a marketing budget that will help you stay profitable as you acquire new customers over time – potentially saving you from eventual bankruptcy. In the Starbucks case study, for example, Starbucks would need to spend less than $25,272 (or less, depending on the equation used) to acquire a new customer to stay profitable. Spending more than this on marketing would put Starbucks at risk of losing money. Customer LTV can help you determine the value of your company, act as a benchmark for future scalability, and understand the importance of repeat business. Finding out your customer LTV can open the doors to many other integral calculations for the future of your company. It can also bring home the importance of increasing your customer return rate – something you can accomplish with smart eCommerce digital marketing. The secret to maximizing customer LTV at your company is figuring out how to increase your customer return rate. Increasing purchase frequency and average order size per buyer will multiply your customer LTV correspondingly. Mastering digital marketing for eCommerce is the best way to achieve customer retention. Inbound marketing using customer data can allow you to nurture leads, create personalized content, and target the right customer at the perfect time to facilitate purchases – ultimately elevating customer lifetime value. The goal of inbound marketing is to use multiple touchpoints to interact with customers at the perfect time to get them to buy again. You can accomplish this using a variety of tactics, from optimizing your website for search engines to building tailored email campaigns. Email marketing automation using workflow goals is one of the most popular and effective ways to engage with customers and encourage them to buy again. An email workflow, for example, can use automation software to create personalized workflows based on information you have about a lead. Your workflow can be unique according to your customers and company. Browse examples for an idea of what you might expect from an automated email workflow system. Some use content offer downloads as workflow triggers while others use blog subscriptions or landing page visits. It’s up to you to decide where your trigger will work best for your company, as well as the stages of your workflow to garner the best results. The point of an email workflow is to re-target and re-engage customers who have shown interest in your brand before, to facilitate returns and repeat buyers. Email workflows aren’t the only way to snag repeat customers. Brands use a myriad of marketing techniques to stay relevant to a customer. Encourage them to return by rewarding brand loyalty and using strategies such as upsell or cross-selling opportunities on your website. Upselling and cross-selling through similar product recommendations can significantly boost your revenue. Upselling can increase profits per purchase, while cross-selling can keep a customer on your website longer, encourage the user to explore other products, and increase the odds of cinching a sale. The goal of upselling is to advertise a better or higher-value product than the one the customer has shown interest in buying. It might be the same product with additional features, such as YouTube Red vs. traditional (free) YouTube, or a later model of the item. Upselling recommends products the buyer might want to “splurge” on, because he or she is already buying one version of the item. Cross-selling encourages the purchase of similar products the user might not have seen otherwise. Both marketing techniques can result in greater average order values – thus increasing your average customer LTV. Customer retention is all about making the buyer feel special. Repeat buyers want to know that you know they are loyal to your company. They want a real relationship with your brand, along with personalization efforts that make them feel appreciated at your business. Custom-tailoring your marketing efforts with strategies such as customer-data-driven ads, personalization tokens on emails, and exclusive rewards for loyal customers can go a long way to convince a customer to keep buying from you and not your competitors. The easiest and most effective way to conquer personalized marketing is through an inbound approach. Inbound marketing is a comprehensive strategy that’s focused on attracting leads, converting customers, and closing sales. It uses relevant, personalized, value-driven content to inform every stage of the buyer’s journey – all while delivering real-time data to evaluate the returns of your efforts. Instead of fighting for your customer’s attention, appeal to them by creating content that addresses their unique needs. From capturing the attention of someone who isn’t aware of your brand to turning qualified leads into loyal customers, an inbound strategy can do it all. Inbound marketing provides an unparalleled level of personalization at every stage of the sales funnel, making it one of the most effective forms of marketing in existence. While your company attracts new loyal buyers, a powerful underlying system will collect and analyze data to optimize your inbound methodology. It’s a comprehensive solution to maximizing customer lifetime value for eCommerce sites in all industries. Finally, continue to find new ways to advertise to your ideal shoppers and lengthen customer lifetime values by constantly evaluating, updating, and tweaking your marketing strategy. You can only achieve strong, long-term eCommerce success when your brand is scalable and ready to adapt to new customer needs. The best way to track your progress and make effective real-time changes is by working through a trusted agency, such as digitalJ2. Recently, digitalJ2 helped a company called G FUEL increase its existing customer sales by 63 percent in just nine months. 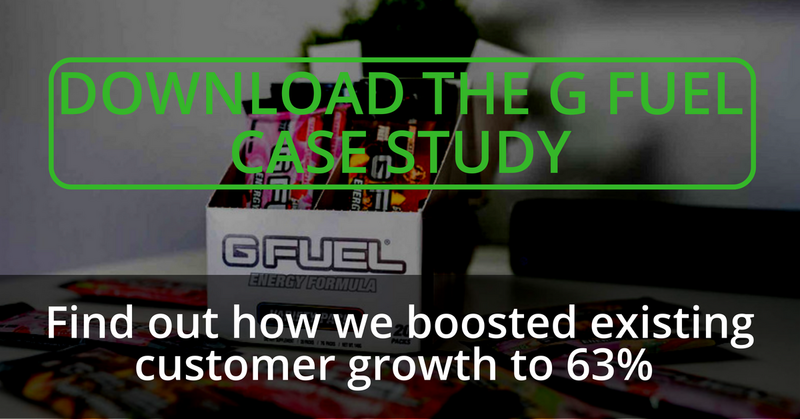 We accomplished this in part through feedback loops: G FUEL gave its customers promotional offers in marketing emails, such as coupon codes and promotions based on individual customer feedback. We tested what worked for the company and what didn’t, using tracking and reporting systems. G FUEL never wasted time or money on marketing efforts that didn’t deliver. Instead, digitalJ2 provided a snapshot of what tactics worked to allocate attention to the right strategies. To become an inbound marketing success story, you must be able to inform your strategy using data from your actual customers. Inbound marketing provides a flexible, scalable, and cohesive way to make real-time improvements to your marketing efforts through data analytics. Help from an agency in automating your marketing efforts can ultimately maximize your returns on investment by making these processes easy. When it comes to mastering eCommerce digital marketing with the goal of increasing customer lifetime value, inbound marketing with digitalJ2 is the answer. Your eCommerce company can increase average order value, size, frequency, and customer LTV. Tactics are available to enable this type of growth at your business. It is how you go about implementing these strategies that will decide whether you succeed. Partnering with an experienced agency can make the transition from what you do now to a stellar digital marketing strategy easy. We will work closely with you to develop a plan that works for your particular company needs. Then, we’ll personalize your efforts for your customers using sophisticated data tracking technology. We can try different strategies risk-free for your company to see what works and what doesn’t. Then, we can grow your customer lifetime value exponentially through the power of customer retention and repeat orders. Our team knows all the best practices for digital marketing in eCommerce and can transform the way you do business. Contact us for more information about how we can help you.